I like to think I don't complain that often, but that's probably not true when it comes to tea. I used to complain about hot tea, but now I'm making the seasonal adjustment to rant about iced tea. If you could call it that. To be accurate, what I'm ranting about is not iced tea, but the tepid fruit-flavored amber-colored heavily sweetened water in massive glasses that's masquerading as "iced tea" at trendy restaurants. At the more pretentious bistros, they have the gall to tart up this tropical bilgewater with a slice of fruit, a sprig of greenery, and a reprehensible price tag. Mind you, this is offered not as an alternative to real iced tea, but as a ghastly replacement. Understand, I would not object to paying $2.95 for a glass of actual iced (meaning cubes, not shaved slush) tea (meaning a strong, dark caffeinated and flavorful liquid that has at some point in its history evolved from the lusty marriage of plenty of camillia sinensus leaves and boiling hot water). In fact, I'd pay quite a bit more. Last month, while visiting my friend Nina in Bellingham, we lucked out at The Big Fat Fish Company and found a waitress who, seeing the our appalled reaction when she confessed (under routine grilling from us) that their "iced tea" was truly some mango-flavored slop from a restaurant supplier, went out to the kitchen and made us a French press pot of hot black tea. She returned with the pot, two glasses brimming with ice cubes, and we proceeded to make real ice tea. And, of course, we left this woman a whopping big tip. I try to imagine the reps from the restaurant supply companies selling restaurants on tropical iced tea, and it's not difficult. Good iced tea is a pain to brew, bulky to store, and, since it goes stale and even ferments after a day or two, it needs to be brewed daily. How much easier, the restaurant manager (probably a coffee drinker) thinks, to just open a big jug of mango-flavored liquid. The stuff looks so pretty in restaurant pictures, watered down with crushed ice! Who cares if it tastes like something that belongs in a toddler's Sippy Cup? 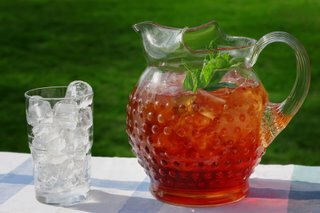 Now that summer's here, I make a pathetic effort to obtain iced tea at restaurants, but it's getting increasing painful. Last week, at a place in Lynnwood, I got one that was, as the waitress promised, free of fruit flavor. It was also free of any flavor, essentially water with a reddish tinge that got even fainter as the shaved ice melted in it. But what truly ticked me off and inspired this rant was the iced tea yesterday afternoon at Sazerac in downtown Seattle. Now Sazerac is a restaurant with Southern roots. Named after a bar in New Orleans, it lives up to its claim to serve "a damn good gumbo." This got my iced tea hopes up. In the South, when you want iced tea, you just order "tea," and it turns up a rich mahogany color with a few big ice cubes swirling in the glass -- a drink every bit as potent and refreshing as a chilled beer or or a "Coke-cola." Feeling optimistic, I asked the Sazerac waiter if they served real iced tea, no fruit flavor, and he assured with much enthusiastic nodding that they did. When, a few minutes later, he presented me with a tall, chilled glass of vaguely tropical-flavored, pale gold, tea-water, gussied up with a big fat slice of orange, I considered storming the kitchen screaming "This. Is. Not. Tea. This. Is. Kool-aid." What stopped me was that I was lunching with a young man who recently married my cousin and I didn't want him to find out right away that food-related insanity runs in our family. So I choked down my disgust and ignored the tea in the interests of a pleasant lunch (I got distracted by the good gumbo!) but this morning found I was still fuming. A Southern-style restaurant with lousy iced tea! So, here's a plea to Jan and Jason (Sazerac's self-proclaimed "fearless chefs"): Sirs, Aunt Safronia would be spinning in her grave if she knew what passes for "iced tea" in your establishment. Heed your heritage, and serve up some "damn good" iced tea. Just brew it! The only good iced tea in NY is in tea rooms. That's it. Otherwise, you're drinking iced sugar.